All latest information about FLAC: FLAC player, FLAC codec, FLAC converter, etc. Speaking of music audio formats, it seems that most people simply don't know FLAC. It is standard practice for them to enjoy or download online music in MP3, for songs marked with MP3 are everywhere. Of course, AAC and WMA have already made a name for themselves as well. But believe it or not, there is still room for FLAC, or rather, for lossless audio codec. This is a FLAC-themed article, mainly focusing on the introduction of best free FLAC players for Windows (10), Mac, iOS and Android, also involving other FLAC related information, like what is FLAC, FLAC vs. MP3, FLAC music download free, etc. The following links will give you a quick access to all parts directly. FLAC is an audio codec format, just as MP3/AAC, but featuring lossless compression algorithm. Statistics show that a set of digital audio data is only half the size of the raw file after being compressed in FLAC or it might be much smaller. Most importantly, FLAC can be de decompressed to a completely identical copy of the original file. The problem is FLAC is not supported on all platforms, which requires a best free FLAC player for Windows (10), etc. Twenty years earlier, while MP3 has prevailed in the world, nobody had heard of FLAC or FLAC player, which had not been created yet back then. No wonder that nearly all devices are MP3 players. But FLAC is not so lucky, which is not a mainstream audio format and accordingly special FLAC player is needed to play FLAC on Windows (10), Mac, iPhone, iPad, etc. It is said that FLAC is better than MP3. Is that true? What are the differences between FLAC and MP3? The following part will elaborate on FLAC vs. MP3/APE. To save your time, you can go get the free FLAC player directly. FLAC uses lossless compression algorithm while MP3/WAV/AAC uses a lossy data compression. FLAC can be decompressed without a single data losing, which makes it always sound perfect, while MP3, WAV and AAC discard quality to some extent for space saving and smooth online streaming. However, there are much fewer FLAC players. APE stands out for the higher audio compression ratio, while FLAC excels in the compressing and decompressing speed. Suppose the speed is fixed, then the compression ratio will be nearly the same. Besides, FLAC is an open format with no limits on patents and has wider compatibility than APE, which can only be played on Windows. ● A best free FLAC player to play FLAC APE MP3 AAC music perfectly. ● HD video player supports all 4K/5K/1080p videos, DVDs and radio. ● Built-in AirPlay sender/receiver enables cross platform video stream. ● Download online videos from YouTube, Dailymotion, Vimeo etc. "I want to find a good sounding mp3 player that plays FLAC/losseless audio. Does anyone know of a music player that can decode FLAC files? It doesn't have to be anything special in terms of looks, but must be cheap or free, and sounds good." As we said, FLAC is not so widely supported as MP3. To be specific, FLAC cannot be played back natively on iOS, OS X, Android 3.0 and before, Windows 7 and before, etc, unless you download third-party apps/plug-ins. Windows Media Player and Android phones like Samsung Galaxy started working as your portable FLAC players since Android 3.1 and Windows 10 added native support for FLAC audio codec. In recent year, more and more car devices and home audio system /home media servers are turning themselves into a FLAC player, such as Citroën DS5, Tesla Model S, Sony's High-Res Audio Players, Pioneer, Cambridge Audio, Logitech, Seagate FreeAgent Theater+ HD, HDTV Network Media Player, etc. Here we are presenting a best free FLAC player, which decodes not only FLAC music, but also MP3/AAC songs, 4K/8K movie videos, etc. Firstly, 5KPlayer is a totally free music/video player available in both Windows and Mac versions that can be safely downloaded from Softonic.com, a well-known software discovery and download portal. Then 5KPlayer functions as a professional FLAC player, focusing on providing superior audio playback experience. You don't have to install any third-party codecs or plug-ins to play FLAC, APE, MP3, AAC, MIDI, MKA, OGG, PCM, WAV, etc. Besides, it enables video audio airplay among computer, iDevices and Apple TV. Easier than VLC, more powerful than QuickTime. If you're tired of VLC's complexity and you're looking for a more powerful alternative to the default Mac OS X media player, 5KPlayer just might be an excellent middle ground. The program is malware-free according to Virus Total and Web of Trust. And having tried it, I tend to agree that it's pretty impressive piece of work." Media savvy computer users will likely have several media players on their computer to perform different tasks. However, there's an easier way to do things with 5KPlayer for Windows devices. Although there are various media player software in the market, none of them is as comprehensive as 5KPkayer. Download 5KPlayer for Windows or 5KPlayer for Mac first and get it installed immediately. 1. 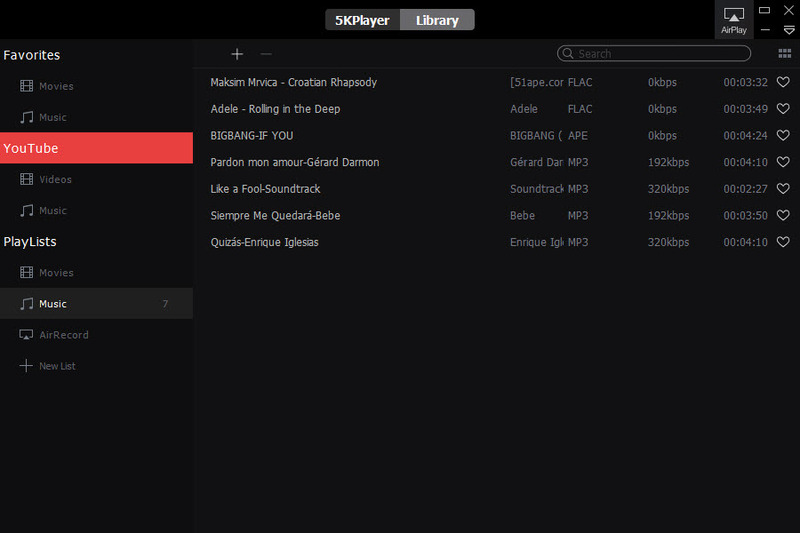 Open the free FLAC player and click into the Music module. 2. Load your local FLAC files by clicking the "+" button or drag and drop the song directly to the main interface. 3. Double click to play your FLAC music. 1. Switch from "Library" to "5KPlayer" mode. 2. Right click the interface, choose "Audio", Equalizer Style, and then select the style you like, such as classic, dance, large hall, pop, techno, etc. 2019 Best 5 Free Media Players – Free Download!